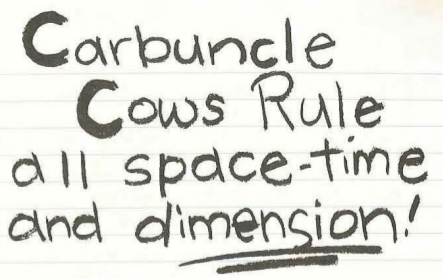 Alternate title card. 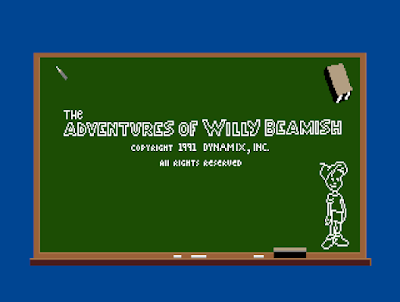 At least this time, Mr. Beamish’s name isn’t obscured. I am coming into this game completely fresh: I have never played it and I know almost nothing about it. I heard of the game as a kid and I know that it is a comedy, but much of what I thought I knew about the game was just my misremembering Freddy Pharkas (1993). Willy Beamish is not a “frontier pharmacist!” (Someone should remind me to volunteer for that one when the time comes as penance.) I do not see any familiar names in the game credits, so my guess is that they are not using Sierra’s new SCI engine that we have seen on close to a half-dozen games already. That engine is a favorite of mine, but its limited vocabulary makes many puzzles all too simple. The game was designed and directed by Jeff Tunnell, the Dynamix founder, and he played the same role on Rise of the Dragon. We’ll see him again on pretty much every other Dynamix adventure game, starting with Heart of China later this year. The “screenplay” was done by Tony and Meryl Pertuz, neither of which appear to have any other adventure game credits. Other writers include David Selle and Tom Brooke. David had been a writer in Rise of the Dragon, and we will see his work again in several games, but most notably as an assistant director on Space Quest V. Tom will be a writer on Heart of China as well. In total, 49 contributors are listed in the manual which is roughly where we see Sierra titles during this period; it is fewer than SQ4 but more than KQ5. I doubt very much that quantity equals quality, but I marvel at this explosion in the size of teams making games during this period, especially as the “Missed Classics” I’ve been playing are lucky to have three contributors at most. 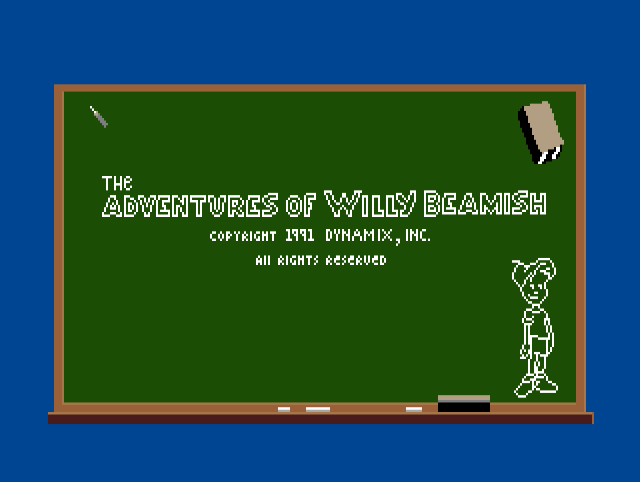 The manual for the game is framed as Willy Beamish’s “secret notebook”, a pencil-written introduction to our game’s protagonist. 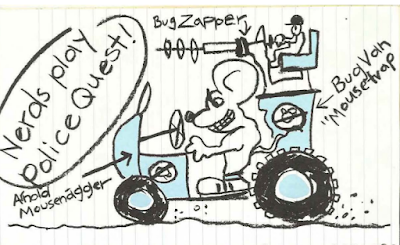 Like the Space Quest IV manual, there is very little technical content here and nothing about how to actually play the game. We had a great debate on the blog a couple of weeks back about whether or not you should have to read the manual before you play a game, but the developers of this one are gambling that we can figure it out as we go along. We shall see! So, it’s just like “The Wizard”? Is Fred Savage in this game? 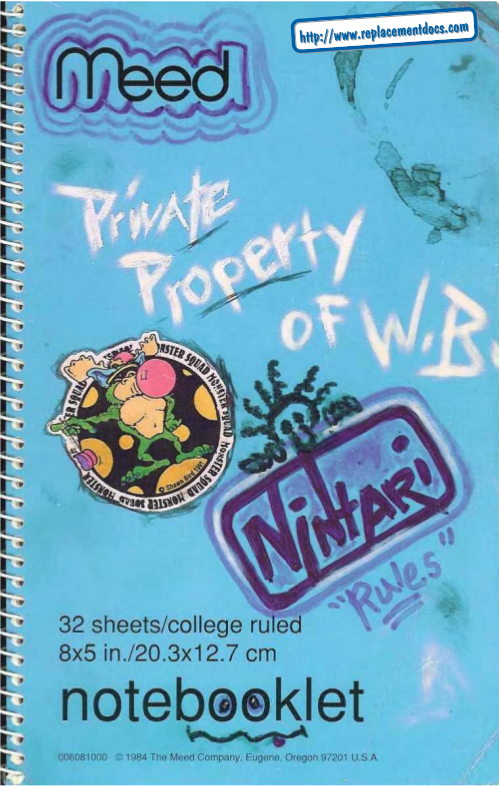 The bulk of the manual sets up Willy’s ambition to dominate at the “Nintari Championships” this summer, and even features a mock-interview with Willy about what he will say when he gets the prize. For our younger or more forgetful readers, this is obviously a portmanteau of “Nintendo” and “Atari”. By 1991, Atari was already an “old-fashioned” brand with their last home system being the Atari 7800 in 1986, while Nintendo was riding high just at the end of the original NES era. (The Super Nintendo came out in the US that August.) 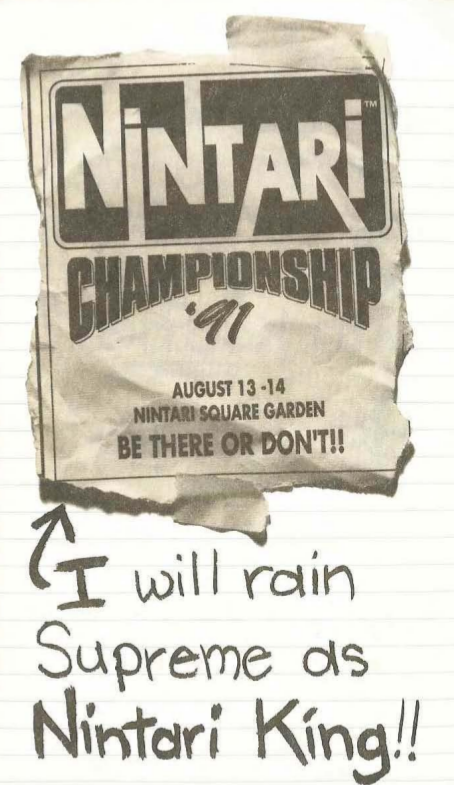 Later in the notebook, Willy has a newspaper clipping from when he won the Nintari regional championship, so he’s probably quite good! This sounds like a plot point if I’ve ever heard one. A diagram of Willy’s ideal tree fort. It has a “mondo” TV and beanbag chairs, not to mention a cola dispenser and a place to store Willy’s skateboard. Willy claims that his “best friend” is the ghost of his departed grandfather. Tons of doodles and comments about classmates and teachers. Not sure if any of them are relevant or if it’s just adding color. Hey! Are you calling Alex a nerd? I am probably paying far more attention to the manual than was intended, but it’s very nicely done and it gets you into the spirit of the game pretty well. I have no idea what the game is like, but I think I get a tiny grasp of the humor that I can expect. 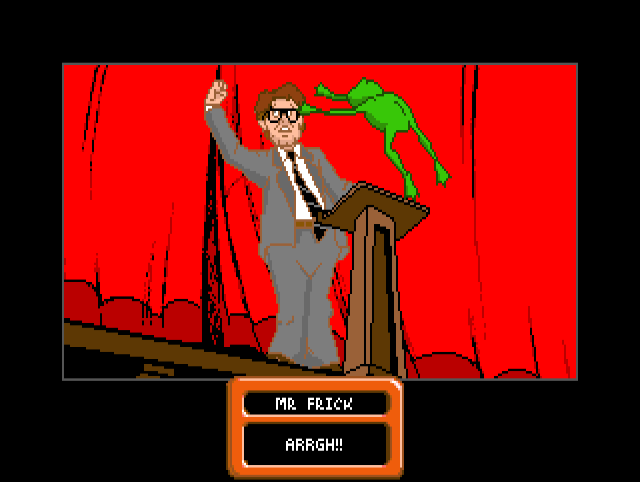 If “Horny” the frog is any indication, I’m going to be looking back wistfully about the mature humor of Leisure Suit Larry 5 before you know it. There’s a Doctor Who joke, so it can’t be all bad. 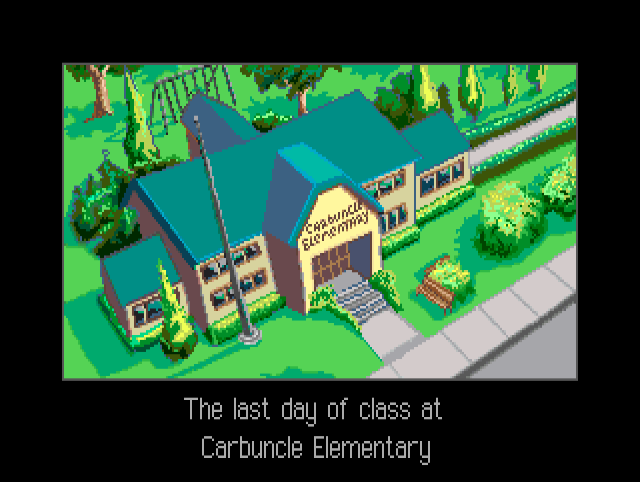 The game begins on the most important day of the year: the last day of class before Summer Vacation at Carbuncle Elementary. I made the mistake of Googling what a “carbuncle” was and I absolutely do not recommend it. What is seen cannot be unseen and I am not kidding about this. On this final day of school, the young Mr. Beamish struggles to pay attention during a farewell ceremony led by his principal, Mr. Frick. For our non-American friends, this person might be called a “headmaster” where you live. The speech is very boring; so boring that after a page or so the writers of the game just stick “blah, blah, blah” in the text box. The guy with the sunglasses had the right idea. While Willy and many of his classmates dozed off to the sonorous tones of their principal, something began to stir in his backpack. Yes, it was Horny! I’m not sure that a backpack is a good place to keep a pet frog, but we can go with it. 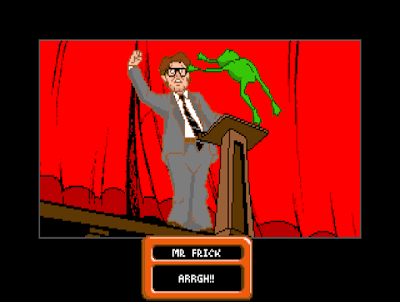 Horny took a leap and landed on Mr. Frick’s head, knocking his toupee right off. Horny is doing some cosplay as a Battletoad. 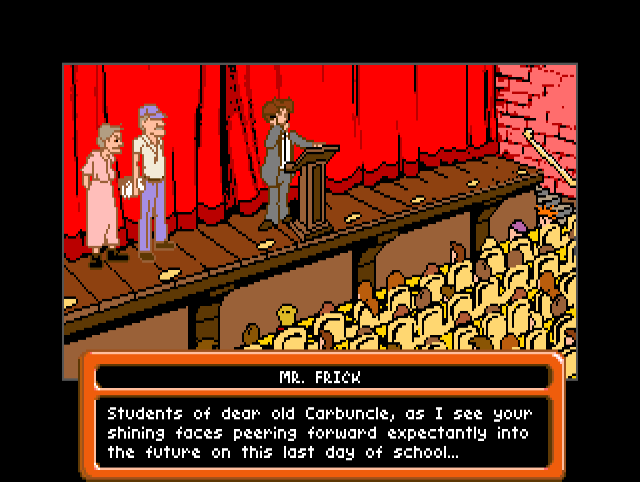 Needless to say, the now-bald Mr. Frick was not at all happy about the amphibious attack and gave Willy detention. 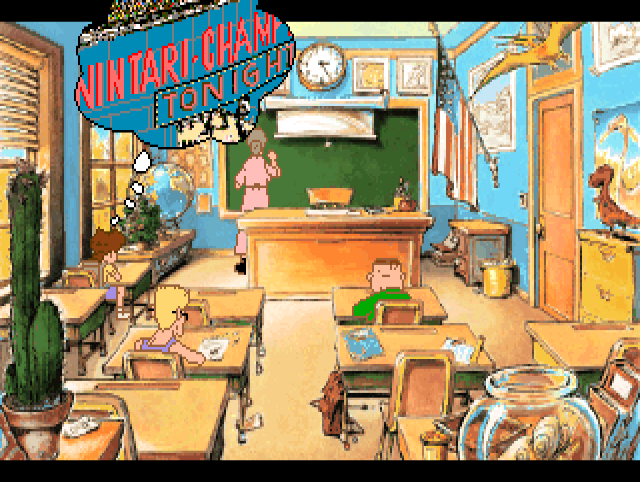 We fast forward a few hours later and Willy is bored in detention, his mind already on the looming Nintari championships. Will he be able to make it and win? More importantly, am I going to need to master some silly arcade sequences to complete this game? I sure as heck hope not. Perhaps sunglasses-kid was caught after all! 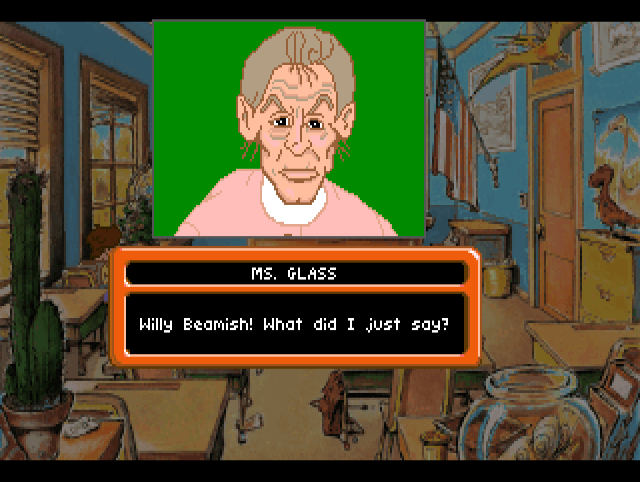 Willy’s daydreaming was interrupted by his teacher, Ms. Glass. He hadn’t been paying attention and she asked him a question. Oh no! Ich kann Glas essen, das tut mir nicht weh. 4. That bananas are a great source of potassium? And with that, our game begins! I like the intro a great deal and it sets the stone for the story. The humor so far seems pretty okay. 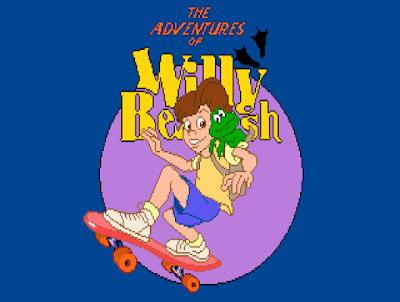 Willy is obviously not like any other adventure game protagonist I’ve ever played and I am not sure exactly how that will translate in the game. I recorded the whole introduction (except for the opening credits) and it’s well worth a watch. 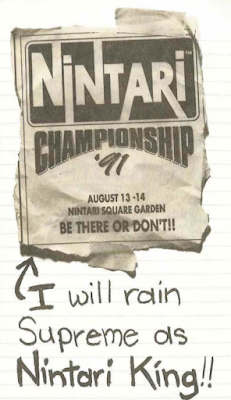 The goal of the game will be to win at the Nintari Championships. There will be some sort of “road trip” element where Willy has to make it to the contest on time. Willy will meet his school friends and teachers over the summer in unexpected and hilarious ways. Horny will be used to solve at least one major puzzle. The game designers will make fun of their overlords, Sierra On-Line, in some way. And that’s it. Tune in next week for the first play post! I am excited! Note Regarding Spoilers and Companion Assist Points: There's a set of rules regarding spoilers and companion assist points. Please read it here before making any comments that could be considered a spoiler in any way. The short of it is that no CAPs will be given for hints or spoilers given in advance of me requiring one. As this is an introduction post, it's an opportunity for readers to bet 10 CAPs (only if they already have them) that I won't be able to solve a puzzle without putting in an official Request for Assistance: remember to use ROT13 for betting. If you get it right, you will be rewarded with 80 CAPs in return. It's also your chance to predict what the final rating will be for the game. Voters can predict whatever score they want, regardless of whether someone else has already chosen it. All correct (or nearest) votes will go into a draw. The final post on Questprobe will be delayed by a week or two as I await the arrival of additional comic books. Marvel made greater use of the Questprobe characters than I had originally thought and it is taking time to gather up all of the books. But never fear, true believers, the Questprobe Epilogue will be coming along soon. Excelsior! My plan when I have no idea about a game is to pretty much take an average of the other guesses. So, just to do some calculations, the average so far is... ... ... 47. So I'll go with that. When I don't know, I look back on previous games. In this case, Dynamix only released "Rise of China" up to this point and received a respectable 56. Unfortunately, I'm not allowed to guess on this game which I think is a real shame. I think you meant "Rise of the Dragon". And, if you guessed and won, there'd be all kinds of accusations of insider trading and possibly even 'shenanigans!' The ACCC would be called - it would be chaos! Also, I'm pretty sure I bet too low but rather than change my guess I'm just going to hope the game is much worse than it seems! Yeah, it sounds like it would tell the tale of chairman Mao rising to power. and suddenly decided that they had to make adventure games, too! Their earlier spy-themed minigame collection David Wolf: Secret Agent was the end result of long lusting to make basically an interactive movie, which would have fallen under the adventure umbrella, but the technology (mostly file storage) just wasn't there yet. It's been a while since I played the game, but I do remember it had some fun scenes. Let's say 52. No idea about rating, so I'll guess "slightly better than Rise of the Dragon." 58? "Willy claims that his 'best friend' is the ghost of his departed grandfather." That's...kinda messed up. Hope this kid gets some therapy. The reference to not being hurt by eating glass is lost on me. I never played this, but the intro post gives off a good vibe or whatever. I'm guessing 59. 51. This looks like a fun game. Going to guess 54. I've never played this before, so I don't know what to expect. 61, just to top the list, I don't really know anything about this game. Whoa! 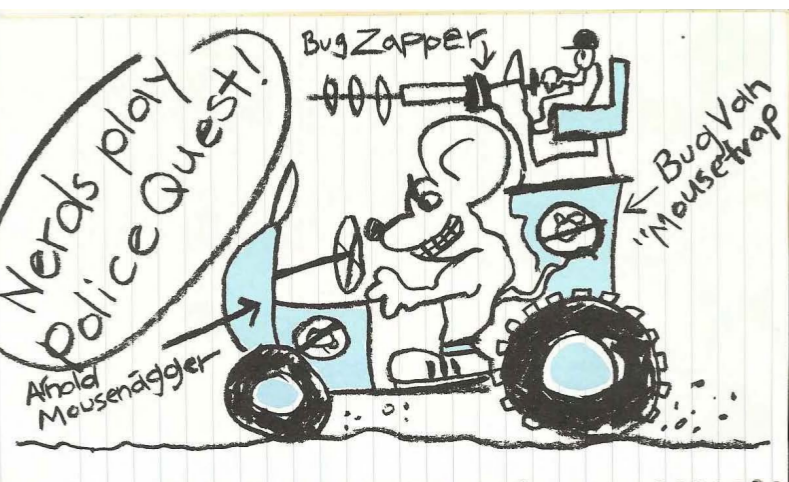 I got called out in a manual from a game that's over 20 years old! I feel so special. I'm going to guess 45 here. Why? Why not. Sees that most are guessing in the 50's. Don't know anything about this game either than I believe was mentioned in AVGN for the... CD-I? Since I probably overshoot Police Quest let's go for a low number here... 42. Probably should pull out my D10's for games I have no idea about in the future, random chance is just more fun and thrilling.